Behold this magazine’s logo in glorious living color! Each dot of pigment is a cluster of yeast cells growing on the “canvas” of a Petri dish. This organic painting was created by Michael Shen, who’s currently working on his PhD in the NYU synthetic biology lab run by Jef Boeke*. It’s the latest work in a new artistic style the lab has dubbed “bio-pointillism,” which makes use of yeast cells that have been genetically modified to produce certain pigments. Shen says they have at least 10 colors on their palette so far. 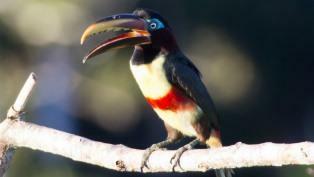 “If you count different shades of color, it’s closer to 20,” he says. The lab members didn’t start with a burning desire to make art. The synthetic biologists began creating brightly colored strains of yeast to prove that they could pull off a sophisticated kind of genetic manipulation. Many labs had previously shown that they could take a yeast cell and insert a piece of foreign DNA that codes for the production of a certain pigment. They could make a yeast cell produce red fluorescent protein, for example, but that trick—producing one well-known protein in one step—wasn’t exciting any more. So the Boeke lab was inserting DNA that codes for the production of certain enzymes, which then catalyze of series of reactions that result in a pigment. 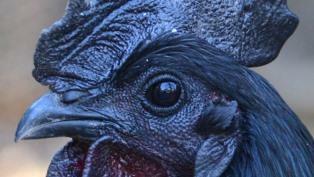 What’s more, the researchers could tweak the DNA to precisely alter each of those individual reactions, changing the end product slightly. The different hues of yeast they produced were an obvious readout of their success. 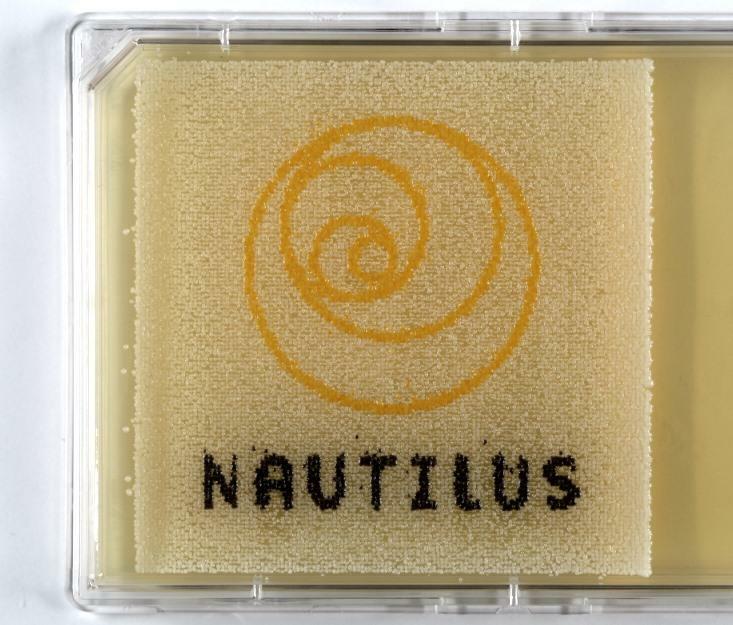 For example, the golden-yellow yeast colonies in the Nautilus logo are expressing beta-carotene, the pigment that colors carrots and pumpkins. 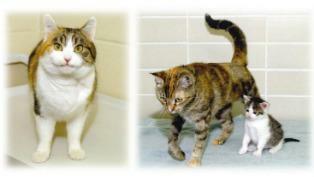 Cells produce beta-carotene in a four-step process. Depending on how much emphasis the researchers put on each of those steps, they could make the yeast cells produce different tints, from yellow to pink. The ability to fine-tune a chain reaction in this way could be useful in the new business of biomanufacturing, Shen explains. Imagine that altered yeast cells were being used as a factory to churn out some valued chemical or biological product. This manufacturing could require a multi-step enzymatic process, but one of those steps might produce an intermediate product that’s toxic to the yeast cell. 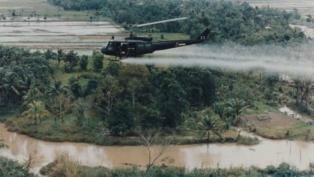 With this technique, the factory overseer (i.e., the geneticist) would minimize that step of the process to reduce output of that noxious agent. 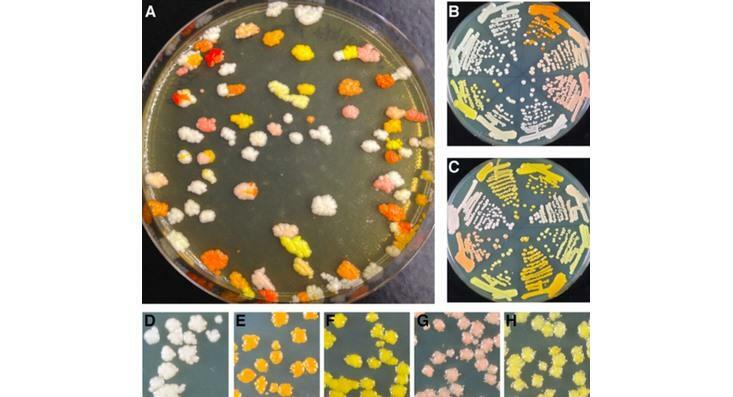 In May the researchers published a paper in Nucleic Acids Research explaining the process, and they included a few photos of Petri dishes decorated with colorful yeast colonies. But it didn’t end there. New grad students in the lab made new colors, and eventually that rich palette posed an irresistible challenge: Could they use it to make art? Abstract expressionism would be easy. “You can take a stick and free-form draw on an agar plate,” says Shen. But the lab members wanted something more controlled. So they repurposed a “liquid handler,” a fancy piece of lab equipment that uses sound waves to precisely place microscopic droplets of liquid on a plate. 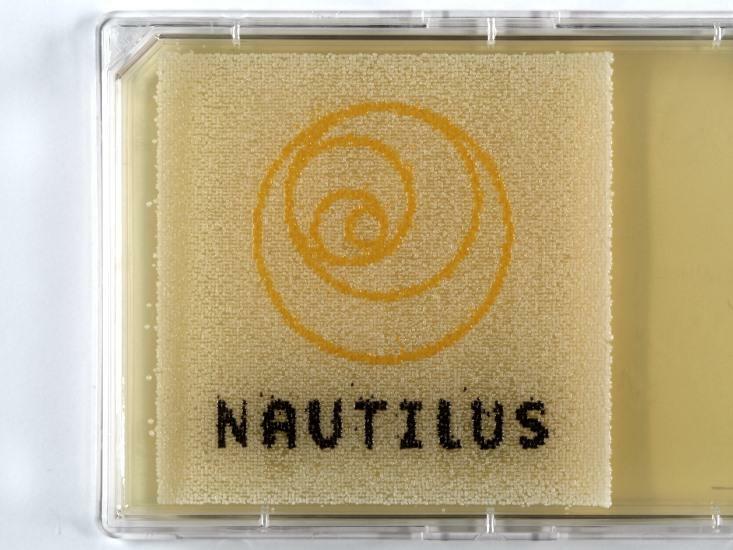 To create the Nautilus logo, Shen used a simple computer program that took the logo image and matched its colors to the available yeast strains. The program generated a set of pixel-by-pixel placement instructions for the machine. Shen put each color of yeast in a tiny well on the machine’s source plate. (The plate has 384 wells, Shen notes, so “we can work with as many colors as we can create.”) Then he just let the machine “do its thing,” he says. The plate that came out of the machine wasn’t a finished work of art; the yeast colonies had to grow in an incubator for a couple of days before the colors truly bloomed. At the proper aesthetic moment, Shen moved the plate to a refrigerator to keep the colonies from multiplying further and fuzzing the image. The lab members have printed portraits, copied a Warhol, and made a wedding present to celebrate one researcher’s nuptials. Shen says he’ll continue to work on this side project, in part because he’s frustrated by their palette’s lack of a green yeast. He needs green, of course, so he can reproduce the archetypal pointillist painting by Georges Seurat. There’s a lot of green on that lawn. * Disclosure: Boeke plays music with my dad. Their band is named after a molecular-biology technique.